We need to send a strong message to the TN State House: Accept the Medicaid expansion now. On the low end of the estimate, 250,000 additional Tennesseans would receive health coverage from this plan. It's also expected that Obamacare premiums would go down with the acceptance of the expansion. Expanding Medicaid can also help insure that we keep rural hospitals open. Most recent data suggests that at least 63% of Tennesseans overwhelmingly favor expanding Medicaid. Republican Governor Bill Haslam supports this plan, and I personally stand with him in this goal. Let's make sure our fellow Tennesseans have access to healthcare. Have a thought on this issue? Let's have a conversation. While making Tennessee an inviting place for businesses to call home, the legislature needs to ensure that the jobs coming here pay livable wages to their employees. I support a modest and incremental increase in our minimum wage, helping to guarantee a living wage to all workers. If you're a worked in Tennessee, you should be able to afford to put food on the table. My proposal for minimum wage: Raise incrementally at $0.75/year, ending at $10.25/hour in 2022. Quick fact: 117,000 Tennesseans currently earn the minimum wage of $7.25/hr or less. Valuing education is one of my most passionate concerns. Not only do we need to better fund existing facilities and new construction, but we also need to place a higher value on the educators and staff members who make our schools great. In a general sense, we need to make Tennessee schools more committed to out students. I think this is best done by making higher investments into our classrooms. Public education is a fundamental right, and in Tennessee we need to ensure that we are offering our students the finest education in modern, safe facilities. As costs for all goods in the private and public sectors rise, our school budgets must also. I'm committed to working with Republicans and Democrats alike to find common ground. We need to better fund our schools, raise classroom budgets, and increase wages for our educators. Haslam promised to raise teachers pay quickly, hoping that Tennessee would have the fasting improving teachers pay in the nation. The reality is that our teachers are receiving a very modest 1% raise per year. I support the original plan of a 2-4% raise. 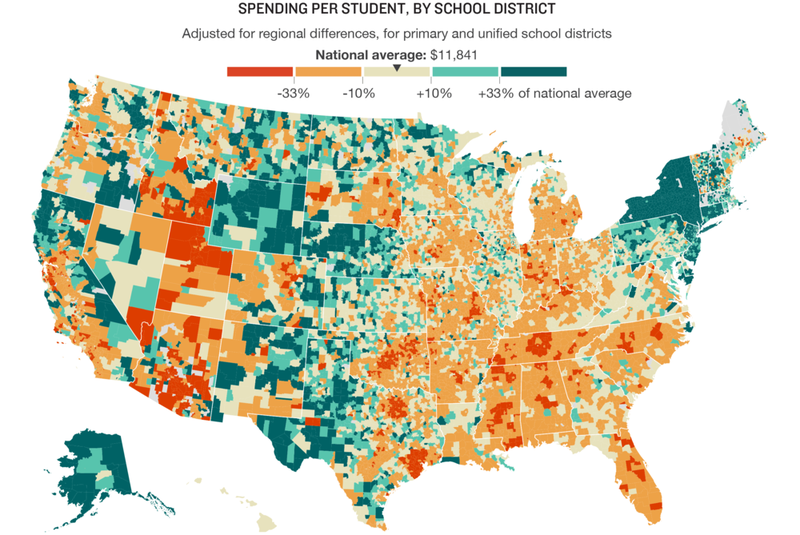 Click to enlarge this image demonstrating funding per student across our nation. In our digital age where technology is king, our rural communities are being left in the dust with little to no reliable high-speed internet access. Business, education, and healthcare all rely on this internet infrastructure to thrive, especially in 2018. Santa Fe, Culleoka, and parts of Mount Pleasant lack sufficient ISP options. We need to change this. I'm committed to working with democrats and republicans alike to bring broadband internet access to the entire state, not just urban areas. This is an initiative and investment that brings business and commerce to our rural communities. 670,000 Tennesseans currently have no high speed internet option. I'm committed to changing that in 2018. We have a long list of major road issues and projects to consider. We need to seek actual solutions to these problems. Nashville has become an absolute economic boom town over the past decade, and the resulting development and expansion of the city has moved commerce in all directions. As Williamson and Rutherford counties have suffered from poor planning in the face of rapid growth, Maury County needs to learn from their mistakes. While we should have been more aggressively planning and expanding our roads and bridges a decade ago, we still have a prime opportunity to adapt to our expanding community infrastructure needs. This is no time for partisan shenanigans. We need real results, and we need them now. I'll support a great idea whether you're a Democrat or a Republican. I believe firmly in voting across the aisle whenever possible, and I believe this is the only way we can truly affect change. Instead of engaging in partisan warfare, I want to bring a voice of change and resolution to Maury County and to the TN State House. Why is it that on average 7 out of 10 Americans are numb to the political games in our state and in the federal government? A severe lack of progress. The citizens of Maury County are tired of business as usual; they're tired of slow to no progress on the major issues. I feel a good deal of our legislative gridlock is partisan-based, and I'm ready to help bring the change our state so desperately needs. Quick fact: 76% of Tennesseans want their leaders to work across the aisle to get things done. Do Tennesseans favor voting strict party lines?